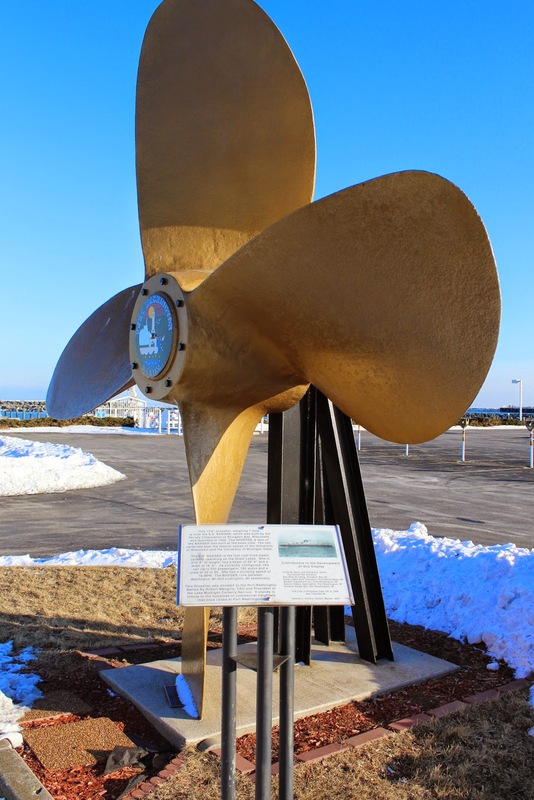 This 13'8" propeller, weighing 7 tons, is from the S. S. BADGER, which was built by the Christy Corporation of Sturgeon Bay, Wisconsin and launched in 1952. The SPARTAN, a twin of the BADGER [sic] was built at the same time. The two carferries bear the same mascot names of the University of Wisconsin and the University of Michigan State. The S.S. BADGER is the last coal fired steam carferry operating on the Great Lakes. She is 410'6" in length, has a bean of 59'6" and a draft of 18'6". As currently configured, she can carry 620 passengers, 180 autos and a crew of 50 to 60. She has a cruising speed of 18 MPH. The BADGER runs between Manitowoc, WI and Ludington, MI seasonally. The Propeller was donated to the Port Washington Marina By [sic] Robert Manglitz, CEO and President of the Lake Michigan Carferry Service. It stands in tribute to the hundreds of commercial freighters that once called at Port Washington. The Cost of Propeller Take Off in 1956 was $100,000.00. The propeller and marker are located at the entrance to a parking lot at the Port Washington Marina, located at the intersection of East Washington Street and Lake Street, at or near 100 Lake Street, Port Washington, Wisconsin 53074. See also, Marker 369: S. S. Badger, a related marker in Manitowoc (Manitowoc County). View of the Port Washington lighthouse from the marker location. The propeller is to the right of this sign. The propeller is located in Port Washington, Wisconsin.